Food poisoning, when not treated immediately can be fatal. It can start as a minor headache and can escalate to a more severe stage in less than an hour of non-treatment. While it can be categorized as an emergency case, there are ways you can help ease, if not stop, the effects of food poisoning. A person who is experiencing the condition should receive medical attention to prevent the most adverse effects of food poisoning. In certain cases, emergency care for food poisoning is needed and a first aid training can help lessen the rate of severity of the condition. When the person is experiencing nausea and vomiting, let him vomit. This is the first step in removing the poison in his body. After this, the person may feel a lot better. Apply cold towel on the forehead to ease the headache. If the person is dehydrated, let the person sip water. The person may experience food cravings later. Make sure to avoid eating greasy or spicy food. Crackers and bread are your best options. The symptoms of nausea and vomiting or diarrhea last for more than 2 days. Allow the person to drink diluted juice once the vomiting stops. In case the person cannot tolerate fluid intake, take the person to the hospital immediately. Severe anaphylactic reaction may occur due to food poisoning that can induce an allergic reaction. 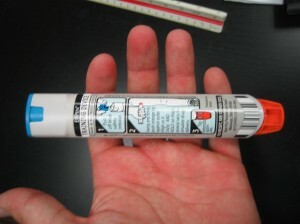 Use an epinephrine kit to prevent the adverse serious effects of anaphylaxis. Small children can easily become dehydrated with vomiting than adults. Make sure to take the child to a doctor to prevent more serious complications on your child’s condition. Take oral rehydration mixtures for fluid replacement after vomiting. Help the person to become comfortable as the condition may result in further agitation to the person’s behavior. Give paracetamol to reduce fever. Sanitize your countertops, kitchen table, plates and other kitchen utensils. Always do the habit of checking the expiration date on the foods stored in your cupboards and refrigerator. Keep in mind the precautions provided in the food labels. Always refrigerate leftovers and throw perishable foods immediately when no longer viable for cooking. Rinse the fruits and vegetables well before serving.